Here we go – the first CES iPod gadget that gets us excited. 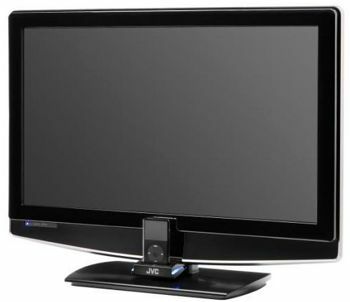 JVC is introducing a new line of LCD HDTV’s that offer playback of iPod video content.¬† Each of the four new models, including three full HD 1080p sets, features JVC’s TeleDock, a flip-down iPod dock at the base of the set, providing a direct connection for playback through the TV. The 42-, 47- and 52-inch models offer 1080p resolution. When an iPod is docked, a menu appears on the TV screen for selecting music, music shuffle or video playback.¬† iPod can be controlled from the TV’s remote, which includes a circular keypad with a control scheme that mimics the iPod’s control wheel. Photos can also be displayed as a slide show along with music.¬† During music playback, song title and artist name are displayed on the TV screen.¬† During video playback, low resolution files, such as internet videos, can be displayed in a small screen mode.¬† Higher resolution video can be shown in nine aspect modes at full screen.¬† There’s also the option to play music files while the TV displays television programming.¬† In addition, the iPod will charge while docked whether the TV’s power is on or off. Besides the iPod dock and playback features, JVC’s new P-Series LCD TVs are full featured high definition displays with a cabinet design that conveys the sets’ focus on both audio and video performance.¬† Each features a new universal remote with direct input access, a new on-screen menu system, a side-mounted USB photo viewer, and ATSC/QAM tuning. The sound package delivers 10 watts per channel to a pair of JVC’s exclusive oblique cone speakers.¬† And JVC’s new Omni Surround package with equalizer offers four listening modes — movie, music, news (for news or talk show programming) and mono (for simulated stereo from mono programming). The TVs are expected to be available Q1 and Q2 2008.